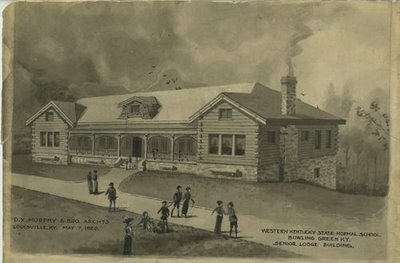 Architectural rendering of the Cedar House by D.X. Murphy. The construction of the building was sponsored by the Senior classes of 1920 and 1921. The logs used in its construction were harvested from a campus hillside in the area now occupied by the old stadium. The students were helped by faculty members L.Y. Lancaster, George Page, Billy Craig and H.M. Yarbrough. It has been used as a social center (1921-1923), the library (1923-1928) and student center (1928-1959). It was remodeled in 1959 and became the known as the Faculty House. Elizabeth Walz, former faculty member was named hostess and had an apartment on the second floor between 1959 and 1960. The building was the home of the College Heights Foundation between 1959 and 1967 and the Credit Union 1974-1983. It was also used by the Faculty Senate and retired faculty. A Faculty House Renovation Committee was appointed consisting of Gretchen Niva, Linda Allan, Sheila Conway, Ann Fields, Charles Eison, Lowell Harrison, Carl Kell and Glenn Lohr in 1986. They proposed several changes in the building layout and repairs. President Kern Alexander provided a new roof while the committee raised money for the remodel. In May 1987 the remodeling was approved.